Approximately ten million Americans have osteoporosis and thirty-four million have osteopenia (low bone mass) with many more at risk. Whether you suspect you may have these conditions or have a friend or relative with osteoporosis or osteopenia, this informative book offers help for men and women of all ages. 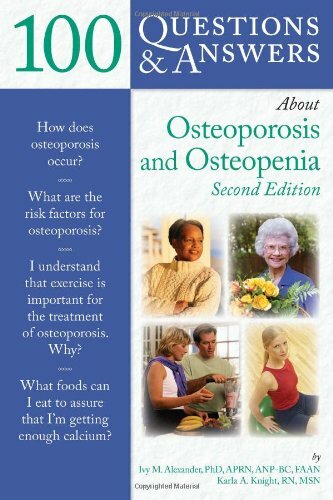 100 Questions & Answers About Osteoporosis and Osteopenia, Second Edition, provides authoritative practical answers to your questions about treatment options, lifestyle decisions to improve bone health, sources of support, comments from men and women with bone loss, and much more. This new edition has been completely revised and updated with the latest information. What is osteoporosis and what does it look like? How does osteopenia differ from osteoporosis? Are there other vitamins and minerals that contribute to bone development? Which bones are affected by osteoporosis? How will I know if I have osteoporosis? Are there any signs or symptoms? How will my clinician use my test results to determine whether I have osteoporosis? I understand that exercise is important for the treatment of osteoporosis. Why? When should I take calcium supplements? Is there any particular time of day that makes calcium more effective? Should I take it before meals, with meals, or between meals? I know there are other vitamins and minerals that are important to bone development. Will I get enough of everything I need if I take a daily vitamin? Can I take prescription osteoporosis medications in combination with each other? Which medications could I use together to get more improvement in my bones? If I fracture a bone, will it change my treatment? Will a broken bone take longer to heal? Will a broken bone be repaired or casted differently? Should I stop exercising if I break a bone? It's hard not to think about my bones being weak. How do I keep osteoporosis from interfering with my life? Are there any medications that I should adjust or stop taking while I'm being treated for osteoporosis? My daughter's friend is only 26 and has recently been diagnosed with osteoporosis as a result of being treated for endometriosis. Is osteoporosis reversible at her age? I'm 60 years old. Is it really worth it to start exercising now? Will exercise at my age help prevent osteoporosis? What should I tell my family about osteoporosis? Will it curtail activities with them? Osteoporosis seems to be featured in the news almost daily. What are some of the future treatments? Are there any new drugs that are being evaluated in clinical trials for the treatment of osteoporosis? This appendix provides drawings of sample exercises with step-by-step instructions. This appendix gives a list of organizations and Web sites that will provide additional information about osteoporosis and osteopenia.